I have today with the help of my lovely husband Adrian updated the Art In Wax miniature Dollhouse Art Shop : Shop for Dolls House Art Now ….. 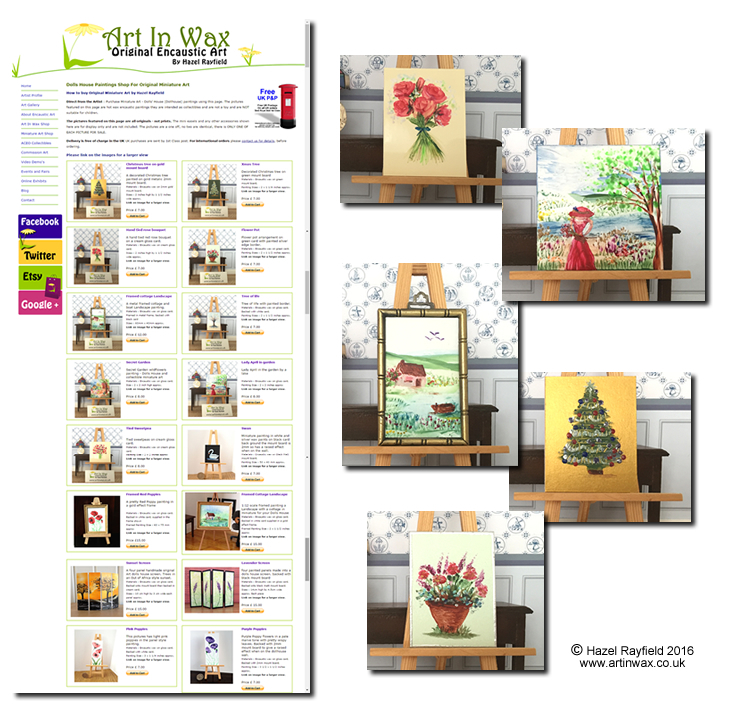 I have added lots of new paintings, including some seasonal Christmas trees which were very popular last year and I know are now in both Christmas themed houses and properties and even some were given as gifts to dolls house owners. There are also new hand tied flower bouquets, a sweet pea and rose one are now listed, if you would like a different flower bunch in this style just let me know and I can paint one especially for you…. I have painted some landscapes, the secret garden and the Lady April ones are both 2 x 2 inches square and an impressionist feel with a softness but colourful styling. Please visit the Art In Wax Miniature shop to buy online via paypal, or contact me if you would prefer to pay in another way. I am happy to ship worldwide, my paintings are in 15 countries across the globe but please contact me first to arrange postage costs. Postage is free to the UK addresses when purchased via paypal on the Art In Wax site. All of your paintings are beautiful. I love them.